For traveling cycle-junkies who like their ride with a side of soul, your prayers have been answered. SoulCycle—fitness for body and mind—has landed on the Strip and is ready to transform more bodies…and lives. With 90 studios across North America, it was a matter of time before the celebrity-friendly SoulCycle moved to town. 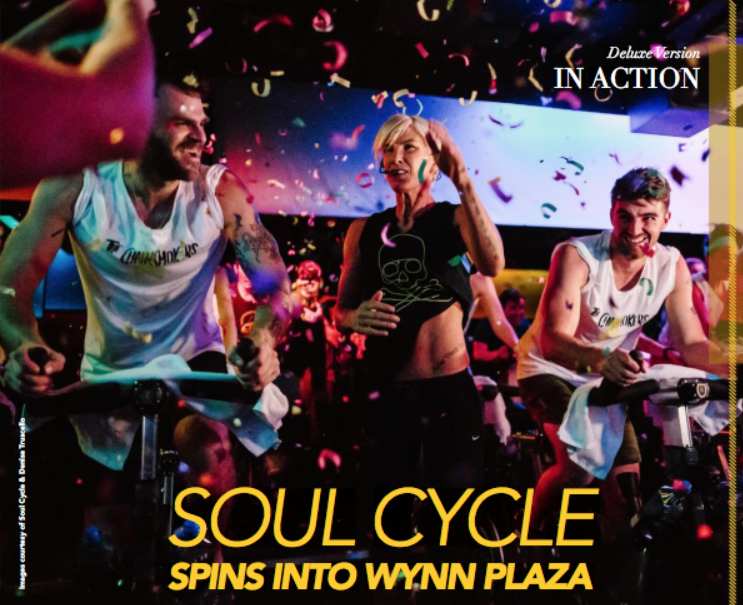 The indoor cycling sanctuary (Nevada’s first) is located at Wynn Plaza…the resort’s recently opened two-story retail destination. And The Chainsmokers (pictured) just launched their exclusive retail collaboration with the fitness company. “As a premier travel destination for both business and leisure, Wynn Las Vegas attracts people from across the globe, and we can’t wait to bring our unique workout to an even bigger audience,” says Melissa Xides, senior vice president of Studio Experience. instructors and (eventually) DJs playing high-energy music…a core molecule of SoulCycle’s DNA. I went to a sold-out, 45-minute Thanksgiving day class, and it was just as I remembered. You feel pleasantly disconnected from your daily life as you “ride with the pack;” get lost in the popular playlist; and, end feeling stronger, and, of course, really sweaty. This studio will definitely cater to both locals (can you say resident discount?) as well as the frequent visitor looking for their favorite fitness fix. So if you’re looking to do some soul-searching; want to buy some soul-style sportswear; or crave sitting beside regular rider (and new Strip-resident performer) Lady Gaga, it’s time to take SoulCycle for a spin. Because believe me: This one-of-a-kind experience is good for the…you know.